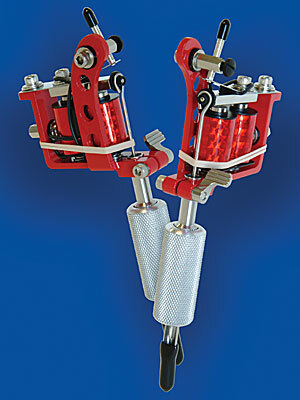 Our newest Puma tattoo machine features a powder coated investment casting frame with a beautiful red finish. It comes complete with a stainless steel tube with our new anodized aluminum 3/4" slide-over grip and our new stainless steel springs. It has 10 wrap coils with red fishscale coil covers, stainless steel needle bar, sterling silver contact screw and contact point, rubber nippled armature bar, 10 MFD 35 volt capacitor, stainless steel hardware and our patented (#D356,944) LeeverLoc™ fastener device. Available in nine needle bar and tube combinations.